The adjustable parameters of six temperature-viscosity models are estimated from two or three experimental temperature-viscosity data points. The models are the traditional Arrhenius model (one parameter); a modified Arrhenius model (two parameters); the Williams–Landel–Ferry (WLF) and Vogel–Tammann–Hesse (VTF) equations (two and three parameters, respectively); and two ad hoc hybrid models, a reciprocal power law (2) and an exponential power law (two parameters each). The first estimate is obtained by using the chosen model's parameter sliders to match a reconstructed temperature-viscosity curve with the two or three experimental points. You can examine the parameter slider positions once a visual match is reached. Except for the Arrhenius model, where the activation energy can be calculated analytically from two points, the estimated values so obtained are used as initial guesses for the numerical solution of three simultaneous nonlinear equations to extract the best model parameter estimates, using statistical criteria. Although it has been shown that the modified Arrhenius, WLF and VTF equations are three different mathematical expressions of the very same model, they are all shown. Traditionally, the temperature-viscosity relationship of liquids has been determined by regression, which requires viscosity measurements at a number of constant temperatures. However, at least in principle, once the mathematical model that describes the relationship is known or can be assumed, its parameters can be determined from only two or three measurements by direct calculation. This Demonstration presents a method to perform such calculations rapidly by utilizing the built-in Mathematica function Manipulate. The temperature-viscosity relationship of liquids has been described by a variety of mathematical models . The most prominent among them is the single-parameter Arrhenius equation , where and are the viscosities at a temperature and an arbitrary reference temperature , respectively, both in ; , the single adjustable parameter, is the "activation energy" in in our case; and is the universal gas constant, . Two alternative models, adapted from polymer science, are the WLF and VTF equations. The WLF equation can be written in the form , where the temperature and the reference temperature —the latter being frequently assigned the glass transition temperature —are both in ° , and and are the two adjustable parameters. The VTF equation can be written in the form , where again the temperature is in , and , and are the three adjustable parameters. These two equations are known to be mathematically identical , but following the literature they are treated as separate models in this Demonstration. In the modified Arrhenius equation , which retains the original mathematical structure of the Arrhenius model, the absolute temperature is replaced by a term , both in , where , and by the term having units. It can therefore be written in the form , where the two adjustable parameters are and . This modified Arrhenius equation has been recently shown to be mathematically identical to the WLF and VTF equations , and hence all three are essentially three versions of the same temperature-viscosity model. Again, though, they are treated separately in this Demonstration for convenience. The two ad hoc alternative equations are the hybrid exponential power-law model, which can be written in the form , and the hybrid reciprocal power-law model, which can be written in the form , where replaces and the adjustable parameters are and . 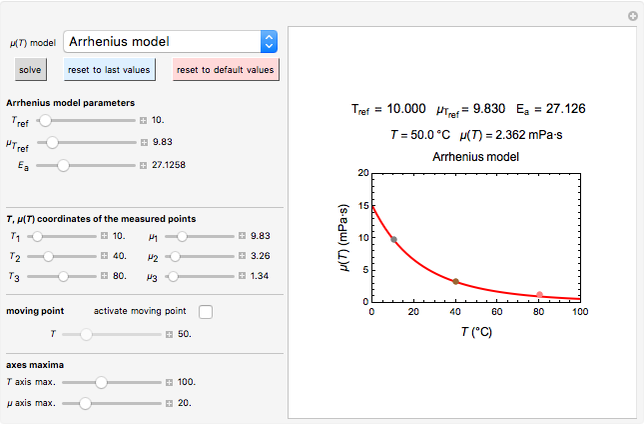 To use this Demonstration, enter three temperature-viscosity data points with their six sliders. The temperatures are in and the viscosity in millipascal seconds (mPa&CenterDot;s) or, equivalently, in centipoise (cP) (since 1 cP = 1 mPa&CenterDot;s). Choose the model from the popup menu. For the original Arrhenius model, two of the entered points are the same—for example, . The points are displayed in different colors adjacent to a reconstructed temperature-viscosity curve generated by the default values. When moving the sliders of the adjustable parameters, try to match the newly generated curve with the data points. When a visually satisfactory match has been obtained, the slider positions can be considered as estimates for the parameters or used as the initial guesses for a more accurate determination of their values. 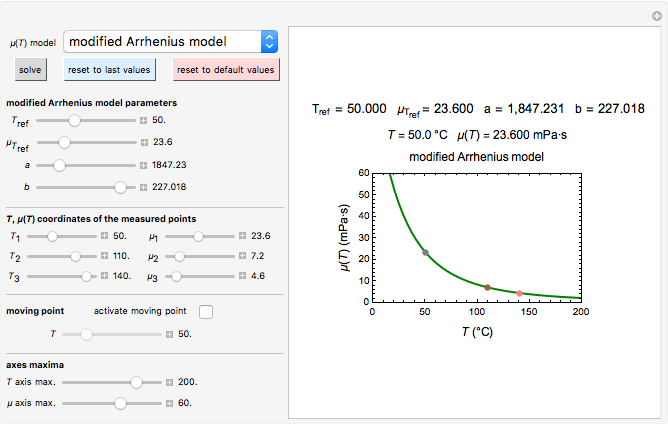 For the more refined assessment, click the green "solve" button to extract the values of the parameters by solving the following simultaneous equations numerically with the built-in Mathematica function FindRoot: for the original Arrhenius model, and ; and for the other models , and , where is the chosen model equation and the values are the entered viscosities at the corresponding entered time . Once the new parameter values are obtained, the corresponding new time-temperature curve will be automatically recalculated and displayed. To estimate the viscosity at an arbitrary temperature other than the two or three entered, check the "activate moving point" checkbox and move the "moving point" slider. A moving black dot will indicate the point's position along the temperature-viscosity curve, and the numerical values of the corresponding temperature and viscosity will be displayed above the plot. Although the described models have been developed for dynamic viscosity, they are probably equally well applicable to kinematic viscosity, albeit with different parameter values. This is because the density changes in liquids for the pertinent temperature range are usually very small in comparison to those for their viscosity. Note that not all possible combinations of the entered temperature-viscosity points that are allowed by the program have realistic solutions (or any solutions at all). Wikipedia. "Temperature Dependence of Liquid Viscosity." (Jun 21, 2017) en.wikipedia.org/wiki/Temperature_dependence_of _liquid _viscosity. C. A. Angel, "Why in the WLF Equation is Physical—and the Fragility of Polymers," Polymer, 38(26), 1997 pp. 6261–6266. doi:10.1016/S0032-3861(97)00201-2. M. Peleg, "Temperature-Viscosity Models Reassessed," Critical Reviews in Food Science and Nutrition, 2017 (forthcoming). doi:10.1080/10408398.2017.1325836. Mark D. Normand and Micha Peleg "Parameterizing Temperature-Viscosity Relations"